The second face transplant procedure in the history of the Nordic countries was performed earlier this year in the Hospital District of Helsinki and Uusimaa (HUS) in Finland. In the first face transplant, performed in 2016, some parts of the facial tissue were transplanted. The most recent operation was more demanding as it involved transplanting an even bigger part of the facial tissue. Planmeca’s pioneering 3D technology and expert service contributed to this intricate and rare operation. Planmeca and the company’s 3D technology were part of the second face transplant operation in the Nordics performed earlier this year in the Hospital District of Helsinki and Uusimaa (HUS). The Nordics’ first face transplant operation was performed in 2016 in Finland, and it consisted of transplanting the patient’s upper and lower jaw, lips and nose, as well as segments of their skin, midfacial and tongue muscles, and the nerves of these muscles. In this second operation, more facial tissue was transplanted from a larger facial area than in the first one. The surgery itself took 25 hours and was carried out by a group of 8 surgeons as well as 20 nurses and other experts. Docent, Plastic Surgeon Patrik Lassus, led the medical team while Docent, Oral and Maxillofacial Surgeon Jyrki Törnwall was in charge of the reconstruction of the bones. The operation was the 41st of its kind in the world to date. Demanding surgery requires not only a skilled medical team, but also technology that ensures efficient planning and safe execution of the operation. 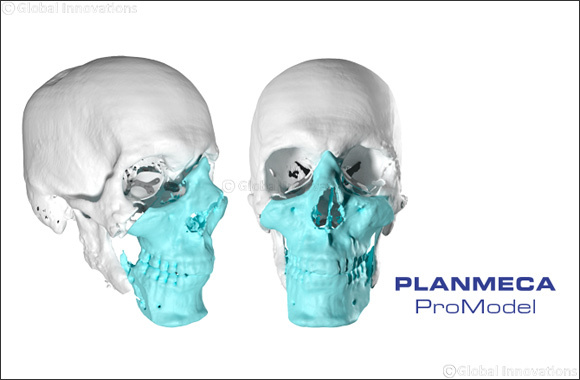 In this operation, such technology was presented by the Planmeca ProModel™ service which offers patient specific 3D planning and implants for surgical procedures. The technology and expertise of Planmeca’s service substantially decreased the operating time and improved the accuracy of the surgery ultimately making the operation safer for the patient. ”Cutting-edge 3D technology combined with strong expertise and know-how is the very core of our service. This second face transplant operation in the Nordics was simulated and planned with our 3D technology. For the operation itself, we designed and 3D printed the surgical guides exactly according to the anatomies of the donor and the patient. These guides saved hours of operation time and ensured the accuracy of the operation,” Planmeca’s CAD/CAM Design Manager Jani Horelli describes. Planmeca has been a trusted partner of HUS in many demanding operations – the collaboration spans nearly a decade. Planmeca participated in planning the second facial tissue transplant right from the start, led by CAD/CAM Design Manager Jani Horelli. Surgeons and engineers are working resiliently together, taking the healthcare industry forward. ”We already worked tightly with Planmeca during the planning and execution of the first face transplant operation, which was successful. It was clear to us from the start that we wanted to continue the cooperation with Planmeca also during this second operation, which was even more demanding than the first one. Our experiences from the first operation brought us certainty for the second one both at HUS and at Planmeca. This know-how made the planning and cooperation even smoother than before,” Dr. Lassus describes. ”This time we transplanted more tissue than in the earlier operation, so the role of technology was crucial. Planmeca and their 3D technology decreased surgery time by hours and improved the accuracy of the operation compared to traditional methods. Without advanced technology, operations of this level could not be performed,” Dr. Lassus concludes.